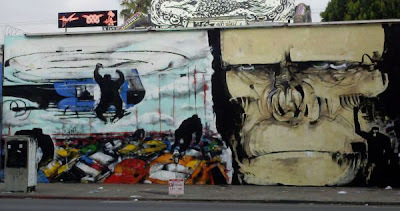 When Lister's Planet of the Apes DVD release mural went up I knew it would cause trouble. His international reputation and unique style place him directly at the center of modern urban art practices, a revered artist amongst many. The advertisement he painted has all of his signature mark making and it blurs almost imperceptibly the line between fine art and advertising content. Given the history of self interested litigious activity on the part of outdoor advertising in Los Angeles, it is a perfect example upon which to make claims that art and commerce are one and the same on the streets of our cities. Sadly this is the last thing a city needs that has been fighting for some twenty years to define an artistic mural so that artists can once again take to the streets and glorify LA with their imagery. While it would seem a simple task, the quote below gets at the heart of why LA has been unable to craft a mural ordinance, but also shows the true colors of an advertising world intent on abusing public space despite the cities interest in curbing their activities for the larger social good. "The big fear from our city attorney's office, due to the past history of litigation, is that whatever kind of mural program we create is going to be perverted and subverted for commercialization and advertising. And that’s what we’re trying to avoid," Blackman says.